The Oculus Rift will make it to our living rooms in Q1 2016, and now we know the UI platform from which we'll view, buy and jump into VR games, plus see what our VR-loving friends are up to, too. 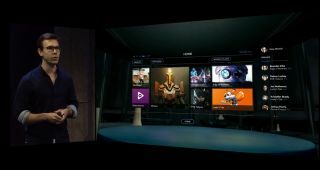 It's called Oculus Home, and with a tile-based UI similar to many other platforms (including fellow viewer Gear VR), it may not be groundbreaking but it definitely looks convenient, at least based on what we saw from the company's press event earlier today. Home will let users preview games and buy them for download. It works with the headset on so you can, presumably, preview, buy, download and play a game without having to take off the Rift. There's also an option to revisit favorites, pick a recently played game or see what's new. There's also a list along the right side of the Home interface that shows friends currently playing VR games and view their favorite titles. Oculus also built a 2D version of Home for monitors. From here, users can browse Home and manage their games and downloads without putting on the headset. Find out what we expect from E3 2015!